I’m thrilled for the people who have been wanting Classic WoW servers for years, and I’m excited for newer players to experience the game I fell in love with back in 2006. I started a little later in Vanilla and rolled my Paladin — the same one I play today — in Patch 1.9. If you’re wondering what to expect from Paladins whenever Classic WoW servers do launch, I’m here to help. Talent trees worked and looked different in Vanilla. You had a Holy, Protection, and Retribution tree, but a Holy Paladin took points in the Protection tree, while Retribution Paladins had points in the Holy tree. Changing talents required going to a trainer and paying an escalating amount of gold. While this system may seem like it created space for unique builds and customization, players solved for the best build and it became the cookie-cutter standard. Raid leaders would question any unorthodox build or talent choices. Each level earned gave you a point to put into the tree. Some talents were simple increases to things like Critical Strike percentage. You’ll notice I said “percentage” and not “rating.” Burning Crusade introduced Rating. Other talents taught you brand-new spells. The final tier of the tree required 31 points, and major spells lived at the 11-point tiers. These included Blessing of Kings, Consecration, and Seal of Command — the least being such an iconic Vanilla spell, it deserves its own section. 31-point spells included Holy Shock, Holy Shield, and Repentance. Blessing of Kings started as a 31-point spell in Retribution, but moved to Protection. Paladins used a Seal and Judgment system. You picked from Seal of Light, Wisdom, Crusader, or Command (if talented). When you cast Judgment, it consumed your Seal. “Seal, Judge, Seal” became the basis of your rotation. You could use Exorcism, but only if the target was Undead — which included Forsaken players for a brief while at the beginning of WoW’s life. Paladins lacked any kind of ranged pull — you ran in and aggroed with your handsome Dwarf mug. Many Paladin took the Engineering profession to solve that problem with bombs. Nothing says “Holy Warrior of the Light” like a bunch of gadgets. The easiest way to level up was as Retribution, though some adventurous (or masochistic) souls tried to level as Protection or Holy. Leveling as Retribution meant using Seal of Command (SoC). SoC was a proc that did 70% of your weapon damage. Paladins would find the biggest, slowest two-handers they could and swing away. When Seal of Command procced you did an enormous hit, usually resulting in a one-shot of mobs. Few things in Vanilla provided so much fun. It helped that the Level 20 Paladin quest awarded Verigan’s Fist, a nice, blue two-handed mace that would outclass anything else a leveling Paladin would see for 20 more levels. But SoC had a downside. The proc-per-minute system didn’t exist in Vanilla. When you got on a cold streak and SoC wouldn’t proc, killing any mob could be a painful experience. It earned the nickname Seal of Casino. Paladin’s weren’t tanks in Vanilla. Yes, we had a Protection tree. Yes, the official manual said Paladins were tanks. We weren’t. We had no cooldowns, little threat, and lacked a skill as basic as Taunt. We wouldn’t get a true single-target Taunt until Wrath of the Lich King. What Protection did have was the core of what would become its greatest strength in Burning Crusade. The Protection tree talents reflected damage back at the attacker. The best application was AoE leveling with a bunch of fast attacking, small mobs beating on you killing themselves. Protection also had a talent called Reckoning. This gave you a chance to gain an extra attack anytime you were critically hit. The first iteration of the talent didn’t have a cap on the extra attacks. One enterprising Paladin dueled a Rogue — a class great at generating critical hits — over and over. The Paladin never hit back. All those extra attacks stored up and up and up. Once he had a bunch, he walked over to one of the major world bosses, Doom Lord Kazak, and proceeded to one-shot him. The developers hotfixed Reckoning the next day, but, oh, it was a glorious moment. The holy trinity of “tank, healer, and DPS” actually had a fourth role in early Vanilla called Support. Paladins had five different buffs called Blessings (Might, Wisdom, Light, Kings, and Salvation). You could have as many Blessings on your character as you had Paladins in the raid. Blessings had a five-minute duration and raids contained 40 characters. The idea was the Paladin would cast a Blessing on each raid member. By the time they got through with all 40, they’d had a few seconds to throw a heal out or DPS the boss, then go back to Blessing again. It wasn’t the most exciting gameplay and, moreover, it didn’t need any gear. As Vanilla aged, Paladins moved away from being buffbots. Holy paladins used Flash of Light, Holy Light, and Holy Shock. 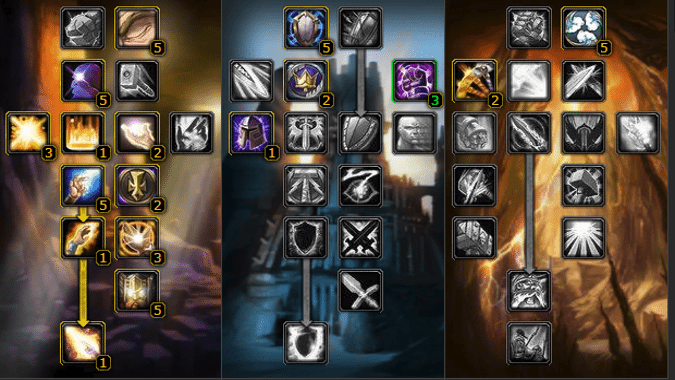 Spells had different ranks in Vanilla and Holy Paladins would have a couple of different ranks of Holy Light on their bar. Mana conservation was a huge concern in Vanilla for everyone except for Rogues and Warriors. Whether you were DPS or a healer, running out of mana was a real possibility. The talent Illumination returned part of the mana cost of the spell when you crit. Holy paladins stacked as much Critical Strike as they could find, often on cloth or leather pieces, and became long lasting healers. Retribution’s DPS wasn’t great, and Protection didn’t function as a raid tank. Paladins became healers only at endgame. There was no specialization-specific tier, so all the tier bonuses tilted toward healing. If you wanted to raid, you put on a dress (cloth with Critical Strike) stood in the back with the Priests and Druids and healed. 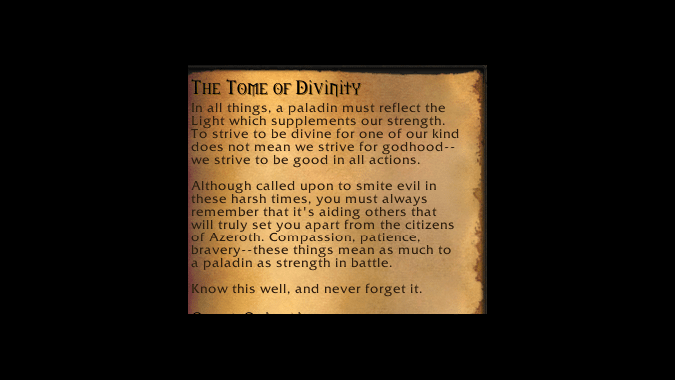 While I’ve highlighted some the issues Paladins had in Vanilla, its important to remember that over those months in Vanilla, I fell in love with the class that I’m still playing as my main to this day. The lore and theme of the Paladin fit what I wanted my character to be. Whether it was uncovering the treachery of the Scarlet Crusade or cleansing the Plaguelands of Undead, I was walking in the footsteps of heroes like Uther the Lightbringer and Turalyon. I was helping the powerless, the downtrodden, the victims and refuges of three wars. I got addicted to the rush of bursting down a mob with a Seal of Command proc. In a move that would foreshadow my move to full time tank in Burning Crusade, I loved the porcupine spec. I would round up a camp full of murlocs or pirates and AoE them down. Undead Rogues wanted no part of me in world PVP. One of thrills in battleground was turning around a point. I’d roll up and see a Mage about to die. With a quick buff of Blessing of Protection, and a heal with a huge Holy Light, I’d watch him burn down the Horde to take the point. 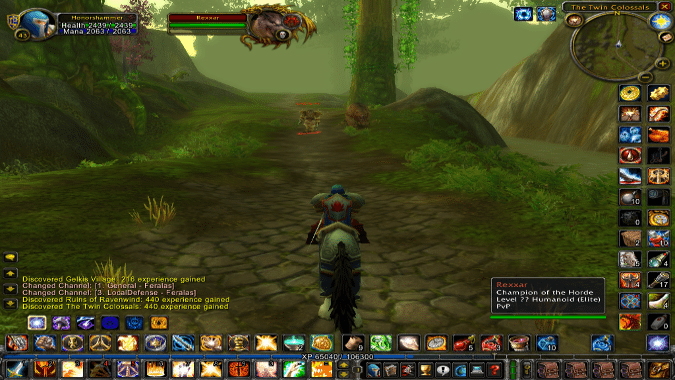 If you’re thinking of rolling a Paladin on the Classic server, it will be fun ride. You’ll go in with far more knowledge and more realistic expectations of end game than we had at the time.